St Vincent Plaza has been designed to provide top quality city centre office accommodation. 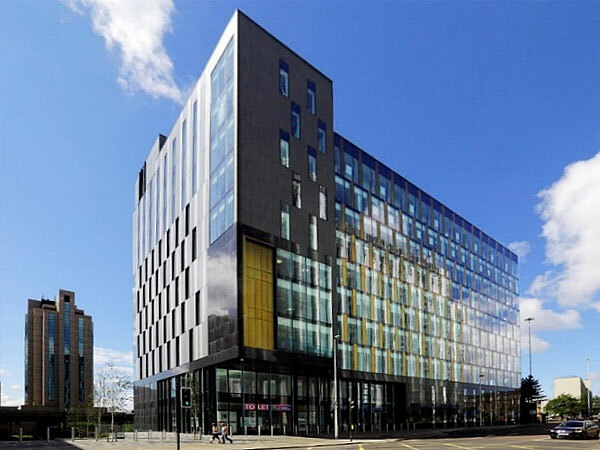 Located in Glasgow city’s business district, St Vincent Plaza boasts an impressive double height reception area with the above 10 floors benefiting from large, column-free spaces due to the structural frame having only 4 internal columns. The building’s steel frame springs off of pile caps and follows a regular steelwork pattern of 9 m x 11 m. BHC fabricated cellular beams with service holes on every floor to accommodate easy M&E integration. A structural steel frame was chosen for this project as it was highly important to use materials that would aid a fast-track construction programme. The building was designed around a number of constraints, namely the adjacent M8 motorway and its connecting flyover. The closeness of the M8 meant that a number of rock anchors protrude into the St Vincent Plaza site. This meant that some of the structures’ piles and columns had to be designed not to clash with the rock anchors. 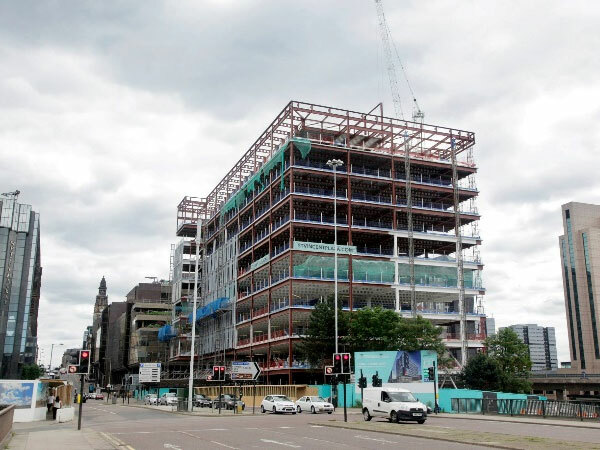 Due to the city centre location of St Vincent Plaza, BHC had to deliver materials on a just-in-time basis with steelwork being erected immediately, leaving the site clear for other trades. The structural frame gains the majority of its stability from diagonal bracing, most of which is located within the building’s centrally located core. However, BHC were required to add additional bracing in other locations to provide additional stiffness, which proved to be a challenge, as there are no internal partitions. Additional bracing is located within the two cantilevers at the north and south elevations of the building. To accommodate the 1.5 m step-in on the ground and first floor levels, a girder and truss arrangement was provided over the second and third floors to add extra support to the floors above and the 6 m cantilever. BHC predominately used the site’s tower crane to erect the steelwork with the exception of the cantilevering girders as this required a 100 tonne mobile crane. In total BHC erected more than 3,300 individual pieces of steelwork as well as installing metal decking and precast stairs.